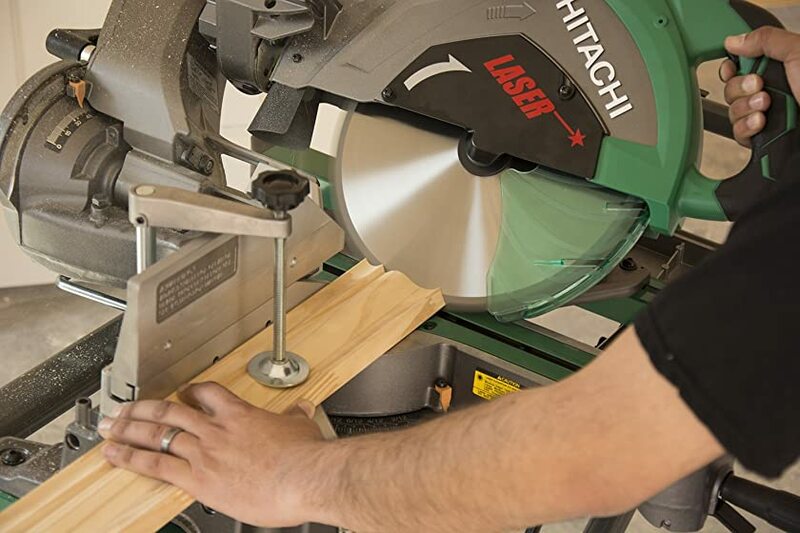 If you’re looking for the best 12-inch miter saw, this guide is everything you should know before making your buying decision. When I was searching for “best woodworking power tools”, I was curious why not many people mentioned about the miter saw. For me, a miter saw is one of the best tools that I have in my woodworking shop, it’s extremely helpful and has been saving me a ton of time. Some folks said that they have had a table saw, so they don’t need a miter saw. I have both of them in my shop, and the fact is I only use my table saw once for every 100 times I use my miter saw. I have found that the table saw is one of the most dangerous tools that I have and using it is the best way to lose my fingers. By contrast, I feel safe every time I use my miter saw. I believe that a miter saw is a machine that any workshop MUST-HAVE, it will really help you work on your carpentry projects more quickly and easily. Though, you may have to spend lots of time to find the one that best suited to your needs and your budget. That’s why I did this guide and review to help you narrow your choice, save your time and your money. I have looked at a lot of miter saws and found that the vast majority of them either have a 10-inch or a 12-inch miter saw. I used both and I think that a 12-inch miter saw is the best choice for most people. So in this guide I want to focus on the 12-inch miter saws and I will also review some of the best 12-inch miter saws on the market, I hope you will find it useful. Once you use the DEWALT DWS780 12-Inch Double Bevel Sliding Compound Miter Saw, you’ll never want to use any other 12-inch miter saw. This is one of the best 12 inch sliding compound miter saw available. It comes with many great features that will help you get your job done super fast. That’s probably why it gets such great reviews from buyers on Amazon. The second best 12-inch miter saw that I think you should consider is the Bosch GCM12SD Dual-Bevel Glide Miter Saw. You will find this is one of the most amazing miter saws you’ve ever used. Some professionals called it “a game changer” and I really love it. But this saw doesn’t come with a light or laser, I believe this feature is the only thing keeping it from being the first. I found that the 12-inch miter saw is more powerful than most other sizes of the miter saw. I think this due to the fact that 12-inch miter saws have a bigger blade and a higher tooth-speed. What that means is more blade teeth impact the material in a given time. A more powerful motor allows you to work quicker, which increases efficiency. Most 12-inch miter saws have a 15-amp motor, which is powerful enough to cut larger and thicker pieces of wood. A miter saw with the ability to cut thicker materials will allow you to complete larger cutting saws. Most 12-inch miter saws offer enough cutting capacity to cut thick framing material, as well as wide trim stock. To my mind, the best 12-inch miter saw is a sliding compound miter saw that allows you to cut through significantly larger materials. It is a great feeling when you can perform a miter cut in a 2×12 or 2×16 (Dewalt DWS780) without cutting partially through the board and then trying to match the cut on the opposite side or switching to the circular saw to finish the cut. Although the choices may seem bewildering, today’s 12-inch miter saws are available in 3 basic styles: standard, compound, sliding compound, dual-bevel sliding compound. Compound Miter Saws feature blades that pivot left and right for angled cuts and tilt in a single direction for beveled cuts. Manipulating the saw on both of its axes at once yields a compound miter cut. Compound miter saws are useful for picture frames, crown molding or any project that requires angled cuts in two planes. They offer the advantage of making compound cuts in one pass. Sliding compound miter saws can cut miters, bevels and compound miters like a compound miter saw. Instead of a fixed pivot point, however, the blade and motor assembly can slide forward and back on a rail. 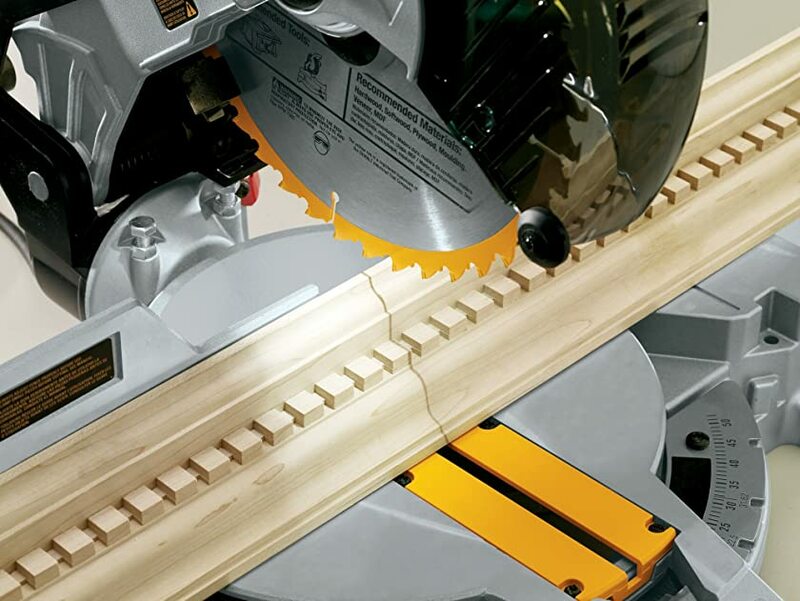 A sliding compound miter saw adds the ability to crosscut wide boards, which is handy for mitering wide baseboards, cutting up to 12-in.-wide shelves to length, or cutting extra-wide crown moldings. It’s the perfect choice for delicate woodworking to heavy-duty framing and deck building. This is the most popular type of miter saw in use today, and I think the best 12-inch miter saw for most people is a dual sliding compound miter saw. This saw functions exactly like a sliding compound-miter saw, except the blade and motor assembly can flop either to the left or to the right, allowing you to cut bevels and compound miters in either direction. The key advantage here is that you can cut a board with the miter and bevel oriented the same way it will be installed, which can save a lot of head scratching. Single Bevel vs. Dual Bevel? Which is the Best? A dual-bevel miter saw is always better than a single-bevel miter saw. Dual-bevel miter saws allow you to make opposite bevels without having to reorient the piece you’re cutting. This saves time and eliminates confusion. In addition, the dual-bevel saws up the ante on quality. Everything about them is more refined and precise. Of course, you pay for the better quality in both cost and weight. The DWS780 12-inch double bevel sliding compound miter saw is not only the best 12-inch sliding compound miter saw available, it’s also one of the best-selling miter saws in the USA so far. I love this saw because of its capacity, compact and lightweight design, all the advanced features, and on top of that, a great accuracy. This is the most accurate miter saw on the market thanks to the Dewalt’s innovative XPS technology. This DEWALT 12 in. sliding compound miter saw is built for heavy-duty use at home or on the job site. It is driven by a powerful 15 amp motor for advanced cutting power in a compact, lightweight design. With extended bevel and miter capacities, this saw powers through dimensional lumber and molding at angles up to 50 Degree left and 60 Degree right for versatility. Tall sliding fences support crown molding up to 7-1/2 in. nested, base molding up to 6-1/2 in. vertically against the fence while easily sliding out of the way for bevel cuts. For me, the best feature of this 12-inch sliding compound miter saw is its integrated XPS (crosscut positioning system) for adjustment-free accurate cut line indication. This system has performed far better than any miter saw laser system I have ever seen. The XPS module projects LED light along both sides of the blade, forming a shadow of the blade on the workpiece. As the saw blade is lowered towards the workpiece, the width of the shadow sharpens, darkens, and closely matches the thickness of the saw blade’s kerf. Position your cut-line to the laser-like shadow, and you will have perfect alignment every time. Changing to or from a thin-kerf blade? No problem, the width of the shadow is created by the saw blade, so the shadow will thin or thicken accordingly. 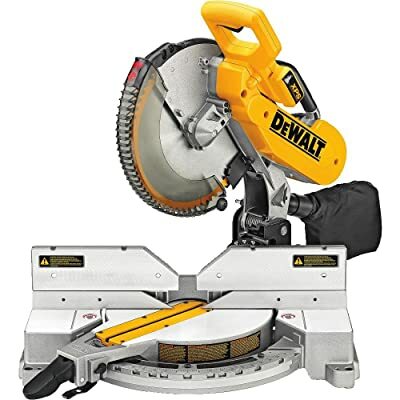 There’re many other great features that come with the Dewalt DWS780 sliding compound miter saw but I think if you read the buyer’s reviews on Amazon before buying this item, you’ll understand why it is the best 12 inch miter saws out there for you. The only drawback is its price, this miter saw will cost you a bit more than others so it may not be the best choice if you occasionally do some wood project for fun. But if your budget allows you to buy, then you’ll be very happy with it. The second best 12-inch miter saw is the Bosch GCM12SD Dual-Bevel Glide Miter Saw. 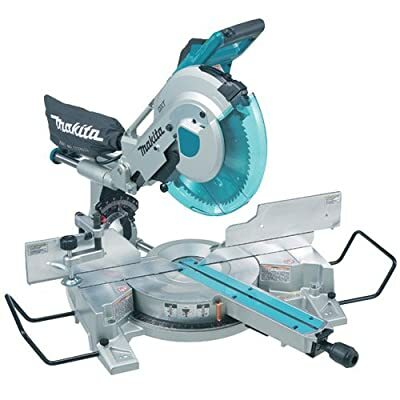 I had the opportunity to try out this miter saw for a month and I must confess to you that this is the most amazing 12-inch miter saw I’ve ever seen. What really stood out and amazed me was its innovative glide mechanism versus the slide rails used by most competitors. This feature allows the miter saw to provide an unbeatable smooth cutting motion and an extremely space-saving design. One thing I was very surprised at is how well the dust collection is when hooked up. It’s difficult to try to make a miter saw have zero dust but if you build a shroud around this and keep the dust collection hooked up, it’s actually not too bad. Most 12 inch sliding compound miter saws achieve their crosscut capacity by using one or more sliding tubes that provide the travel for the blade, transmission, and motor assembly. It’s a time-tested design, but there are a couple of problems. One is that the tubes stick out about 12 in. beyond the rear of the saw, requiring that the saw be positioned that distance from the wall. As a result, you end up with 2 or 3 sq. ft. of wasted space behind the saw—and most woodworkers would rather put that space to better use. Bosch has solved these problems by using its patented Axial-Glide System in this Bosch GCM12SD Dual-Bevel Glide Miter Saw. The saw uses a pair of hinged or articulating arms to provide the travel for its 13-1/2-in. crosscut capacity. And since there aren’t any rails to protrude from the back of the saw, the footprint has been reduced. In addition, it’s very accurate because of the tight tolerances in the hinged arms. And you can adjust the tightness of the mechanism to your personal preference. The saw features a 15 amp motor which delivers no-load speeds of 3,800 RPM for quick, accurate cuts in many materials. It very convenient since the saw is compatible with a variety of 12 In. blades and it has a clear lower guard to provide unobstructed cut-line visibility. There are nine detents for common miter settings. Although we’ve seen it on past Bosch miter saws, I really like the up-front bevel control that eliminates reaching around the back of the saw for bevel adjustments. 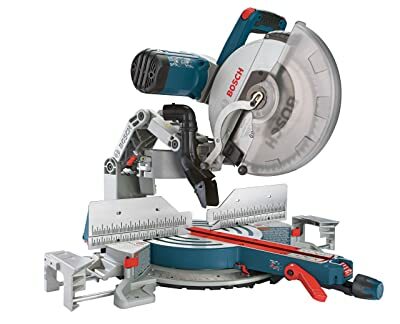 I haven’t yet found out anything of the Bosch GCM12SD that is inferior to the DEWALT DWS780 Sliding Compound Miter Saw, except the fact that this saw has no light and no laser. I believe that this feature is the only thing keeping this saw from being the best 12-inch miter saw in my comparison. Bosch tried to solve this issue by offering an accessory laser washer which is very easy to install. But you’ll have to buy it separately when purchasing the saw. The Hitachi C12RSH2 12-Inch Dual Bevel Sliding Compound Miter Saw is the best 12-inch miter saw for the price. It’s the perfect choice if you don’t have budget for 2 options above. I really like this miter saw because of its compact slide system with large cutting capacity. This saw features a fixed rail slide design that eliminates the need for rear clearance to accommodate the extension of the sliding rails. This system allows the saw to sit up against a wall or to be placed in tight work areas without compromising cutting capacity. 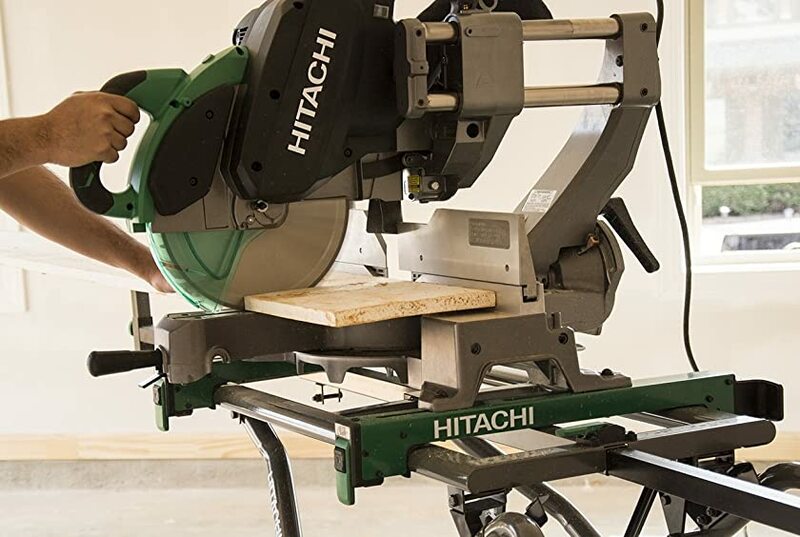 The Hitachi C12RSH2 is an upgrade version of the Hitachi C12RSH – which used to be one of the best miter saws on the market before being discontinued by Hitachi. Hitachi listened to the feedback and added more advanced features into this new sliding compound miter saw. The Hitachi C12RSH2 has improved work efficiency with the compact slide system and wide base which is 630mm, 54mm wider than the C12RSH. It features all new tall sliding fences that allow you to cut much larger material, while easily sliding out of the way when making bevel cuts. The easily adjustable tool-less laser marker allows even the most novice users to make perfectly accurate cuts. There are many other great features of this 12-in miter saw that you’ll find on Amazon.com. But after all, I think you’ll find almost everything you need from this miter saw. This is the best 12-inch sliding compound miter saw for the price that I’ve ever seen. While 12-inch sliding compound miter saws can greatly increase the cutting capacity, they greatly increase the cost too. A 12-inch sliding compound miter saw can cost twice as much as a non-sliding compound miter saw. If you only have a few hundred dollars to spend and can sacrifice the wide cutting capacity of a sliding saw, I recommend buying a non-sliding compound miter saw. And I think the DEWALT DW716XPS Compound Miter Saw with XPS is the best 12-inch compound miter saw you can buy at this time. 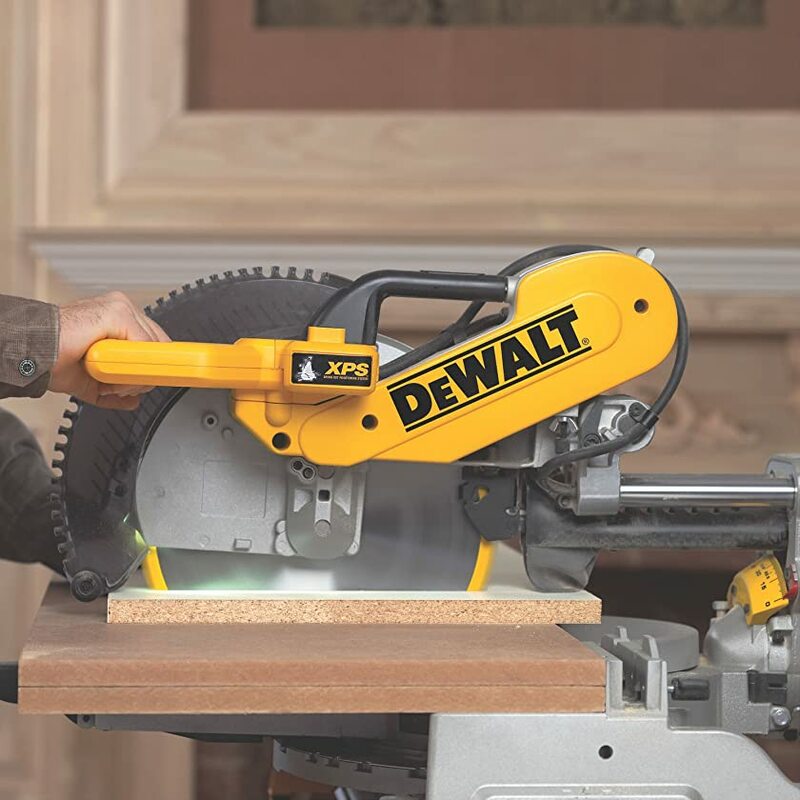 The DEWALT DW716XPS is all you’ll need for 90 percent of interior trim work. It has everything that the Dewalt DWS780 Dual-Bevel Sliding Miter Saw has except the ability to crosscut wide boards. A lightweight and compact design, a powerful motor for advanced cutting power, and one of the most accurate miter system – the Dewalt XPS. I love the fact that this miter saw comes with tall sliding fences that support crown molding up to 6-5/8 in. nested and base molding up to 6-1/2 in. vertically against the fence while easily sliding out of the way for bevel cuts. Even though I can always screw a board to the fence to increase the height, I prefer to have a tall fence available when I need it. 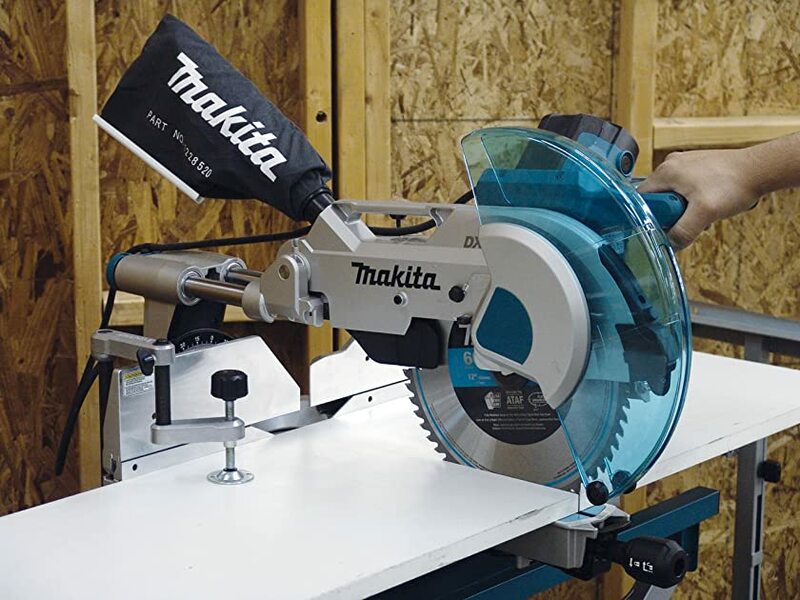 Makita makes some of the best and most accurate miter saws, and the Makita LS1216L 12-Inch Dual Slide Compound Miter Saw is one of the best 12-inch miter saws you can buy. It has several unique features that contribute to an overall impression of superb quality and thoughtful engineering. First, I especially like its clean design, a design that looks very simple but provides just everything you need to get the jobs done. Second, the Makita is the only dual-tilt saw with an angled, geared motor rather than a belt drive. I would expect this design to be trouble free over the life of the tool. Also, it’s the only saw to incorporate two pairs of rails for a smaller footprint and greater rigidity for better quality cuts. Plus, one small feature that’s easy to overlook but very thoughtful is a latch that drops down to best position the saw for ‘fixed’ operation. Just hook the lever and tighten the slide and the saw functions like a non-slider. The Dewalt miter saw has a similar feature. Overall, the Makita LS1216L is an excellent saw and my top pick. If the saw is about $100 cheaper, I could recommend it as a good upgrade from the single-bevel saws, but at the listed price I feel you can do better. The last one in my comparison of the best 12-inch miter saws is the DEWALT DHS790 FlexVolt Sliding Compound Miter Saw. If you ask me who makes the best cordless power tools on the planet, I would say it’s the Dewalt. Dewalt cordless power tools have come a long way since their beginnings. No longer can they be considered puny and inferior to their corded cousins, these tools will charge quickly, stay powered up for a significant length of time and pack a serious punch when called into action. The DEWALT DHS790 FlexVolt is the best cordless miter saw I’ve ever seen. It is powerful, lightweight, and more accurate than most other miter saws on the market. 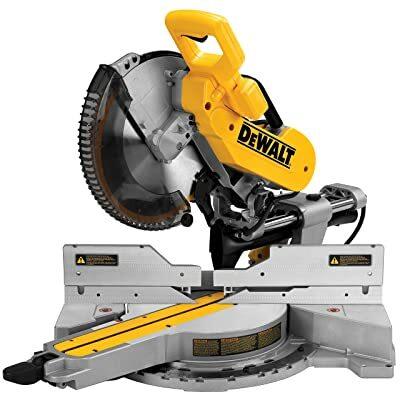 I found that this saw is pretty much identical to the DEWALT DWS780, except you can use it as a cordless miter saw. So if you’re looking for the best miter saw and you already have some Dewalt FlexVolt batteries, the DEWALT DHS790 miter saw is the way to go. For cordless miter saws, power is measured in battery voltage. Higher voltage means more torque-spinning strength to overcome resistance. Most cordless miter saws use 18V batteries which is not enough power for heavy-duty projects. DeWalt’s FlexVolt system changed the game with a battery that can deliver up to 60V so the saw can get 120 volts with only two FlexVolt batteries. According to DeWALT, with the 6.0Ah batteries the Dewalt DHS790 will be able to deliver 2.0Ah of run-time, which should move you closer to the 300 cut mark. And with the new 9.0Ah batteries the DHS790 will be able to deliver 3.0Ah of run-time, which should move you closer to the 450 cut mark. As I found out, a single person using the DHS790 can get a lot of work done on a single battery charge. However, where you have two or more people using the saw it won’t take long before the batteries need recharging. Fortunately, with the DHS790 you don’t have to worry about having replacement batteries ready, you can switch it over to AC power in a matter of seconds. 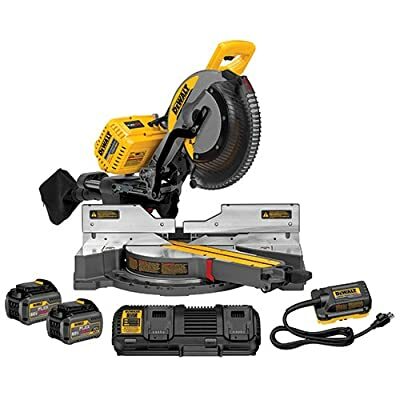 This makes it very convenient for someone who needs to use the saw in an area of the jobsite where power hasn’t been connected, where it might be a hassle to run an extension cord, or the power cords are all in use. Without the dual power source, the DHS790 is a great saw like the Dewalt DWS780. Both of them are the best 12-inch sliding compound miter saws you can buy. They’re solidly built, durable, have a superb cutting capacity, are accurate, have very good dust collection (connected to a dust extractor) and are easy to adjust.